Trisha is not just a heroine who helps people to cross the road and save dogs from dungeons in her films. She does it for real. Her attitude towards being a socially responsible citizen and her special love for animals have been widely noticed and appreciated. Celebrities are nowadays also busy with the Swachh Bharat - Clean Indian Mission campaign, rightfully initiated by our PM. The recent addition to the list is Trisha. Dressed in white, the Mankatha girl along with the volunteers from EFI have cleaned up an animal farm at Mudichur, near Tambaram. 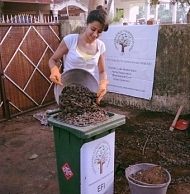 When headturners like Trisha take up such activities, the intent of keeping our surroundings clean just gets twice-fold. Keep going Trisha. You are setting an example. 'Good Men - Thala Ajith And Arun Vijay - Do Exist', Says Trisha! People looking for online information on Actress Trisha, Clean India, Clean India Mission, Swachch Bharat, Trisha will find this news story useful.